Another benefit of warming – California projected to get wetter through this century | Watts Up With That? RIVERSIDE, Calif. — Under business-as-usual greenhouse gas emissions, climate models predict California will get warmer during the rest of the century and most also predict the state will get drier. July 8, 2017 in Climate News. You really have to admire these people. Every time their model is proven wrong (not just off, but the exact opposite) by what the rubes can actually see in front of their eyes – they “reanalyze” it to show that the model is absolutely correct! It was saying that we’ve always been at war with Eastasia! We will prove anything – for money. That’s a scientific approach. When California was in the midst of the drought situation, climate models were always predicting “Warmer-Drier” conditions for the state. A climate of worsening perpetual drought was the model prediction DU-JOUR. Now that a strong El Nino has come and gone moistening the state, the new paradigm climate model DU-JOUR is predicting wetter conditions. Hot weather tends to be dry or drought conditions. So “as the world warms” it will get dryer …. obvious , init? But but, more frequent and more intense storms are to be expected “as the world warms”. But wetter areas will get wetter and dryer areas will get dryer. One thing is certain whatever happens it will “exactly as climate models predicted”, since climate models predict everything ( except a cooling climate which can be avoided by proper data manipulation ). If one examines earth history, we see that warmer periods were generally wetter, for the planet as a whole. How these modelers think they can determine average jet stream positions in a somewhat warmer world is very mysterious. Besides for that, they think they know that el nino years are usually wetter for CA, except for last year, when it was among the driest ever. And this year, when it was the wettest ever after the el nino had ended. It seems not to have occurred to them to simply recognize that weather is chaotic and random. Or that models that can and do say anything and everything are useless. There most likely is a pattern and system to our weather and climate, but since we don’t yet know what it is you can’t model it. I remember past WUWT posts pointing out prolonged dry periods in California in the past. As it turns out, they roughly coincided with the Medieval Warm Period and the Roman Warm Period. It looks like global warming will increase rainfall worldwide and make the Earth as a whole greener, but that California, at least the southern half or two thirds, will buck that trend. Climate models fail because they ignore the patterns in climate. Instead they hope that the patterns will emerge spontaneously if they include enough low level detail in the model. In effect climate science takes rocks and gravity and believes that if they include enough details the rings of Saturn will appear. But reality doesn’t work that way. The rings are not predicted by our models of gravity any more than future climate is predicted by climate models. Quite simply we know the rings of Saturn exist, but complexity prevents us from modelling them realistically on a computer. It is the N-body problem on steroids. Computationally you face the same problem with climate. You can compute what might happen in the future, but it takes the computer longer to come up with an accurate answer than if you simply waited for the future. Nature models the future quicker than can be done by the fastest computer if you are interested in accuracy. It seems to me that the hydrological system is the main mechanism for controlling the earth’s temperature through a negative feedback system. Warmer, melts the arctic ice, creates more available water to absorb heat, increased evaporate, and release of heat at top of atmosphere. At same time, more clouds form, increasing reflection of SW radiation. Colder, freezes water at north pole, removing water thus decreasing heat absorption, and decreasing evaporation and release of heat at TOA. Less cloud formation, less reflection of SW radiation. I never hear much about the role of CO2 functioning as Water Vapor. The Adiabetic theory claims CO2 acts just like water …. absorbing heat at surface, rising in the atmosphere, and releasing heat at TOA, where it goes on to space. But then again, given the differences in ppm of water vapor and CO2, I can’t see that CO2 would play much of a major role. Yes, there are patterns and systems. And also strong elements of randomness, on scales large and small. If there is more evaporation from the oceans, there will be more rain falling on the Earth. Looking back at reconstructions of wet years and dry years for CA over the past few thousand years, we see a few very long droughts, some longer wet periods, but little evidence of any trends that match up with world wise temperature trends. Some long droughts coincided with warmer times, and some with colder times. The LIA appears to have had few long periods of drought, and this extended through the end of the LIA into the modern warm period. Is it cycles superimposed on overall randomness, or randomness superimposed on cycles? Or maybe long terms rainfall trends of many centuries do not match up well with long term temperature trends on this scale. BTW, I think that dendrochronology is fairly accurate at identifying wet and dry years…and for temperature trends…not so much. There is nothing the climate change apparatus could not predict, and no failed prediction can falsify the theory which is amorphous enough. I should not be very far from truth when I predict that the future California could be warmer, cooler, wetter, drier, stormier, calmer, or more extreme. Note the ‘could’ that works as an out-of-jail card. If you don’t act now, you’re a deniér. Not always. Measured temperatures show their models predict to o much warming. However, no one can ignore $200,000,000 in repairs to Oroville Dam which overflowed for the first time in history. It resulted in evacuations and claims of looming extensive loss of life (which did NOT occur, but alarmists are everywhere). All reservoirs not being drained for repairs and upgrades are at historic levels. All ski lifts are operating at Mammoth Mountain today (8 July), with tons of people on their slopes. That’s hard to hide. Temperatures are easy to hide – just change the data. Do you really remember what the temperature was a week ago? No, but it is still irritating to have to detour TODAY around flooded streets in the Reno area, with clever new barriers along other roadways to keep them viable. Sorry – went off the deep end. They wan’t change the warming meme. They will change all other elements that are easy for any to see as fast as they need to, with no embarrassment at all over the fact that the last position was held by 97% of scientists – and all respectable, non-loony scientists. It appears these studies are based the previous year’s weather. All you need for a 83 year straight line is 2 points. If what many people predict comes about – due to the sun’s inactivity – California will get a tiny bit colder and a lot more drier. We will see. If we live long enough. Better get on with fixing that “emergencyauxiliary spill-way” then. Oops. Better get on with fixing that “ emergency auxiliary spill-way” then. I predict it will either get wetter or it will get drier. I predict that it will stay within experimental error exactly the same. I predict it will realise one or more of the possibilities and if the latter I can affirm with complete confidence it will be either a sequential or simultaneous result. . The exact same answer the climate models produce. Based on careful study of the past fed into a super computer and then reversed, I could, might, probably, prove beyond any doubt that the weather will (oh God help us! ), be variable in ways that will be as bad as possible everywhere! Where is the grant application? I believe you’re right, Phillip! Pretty bold! But of course, you didn’t say when! “ In fact, says Heller, Greenland has gained a near record amount of ice this year, and the ice is melting very slowly. Some people seem to blanch when anyone speaks forcefully about what is going on. They think we should all be very polite all the time. Apparently even if it means avoiding frank and honest assessments. Calm and polite does not come through to people caught up in the lies of panic mongers. There are a lot of people who know what is going on but will not even give voice to an opinion, fearing being thought poorly of by the warmista establishment. Sadly…many are cowed into silence or near silence. “They think we should all be very polite all the time. Right on, Menicholas, and me thinks that is exactly why the actions of our elected member to Congress have degenerated to a point of “not return” and rampant dishonesty and self interest. Record cold in Greenland in July is Extreme Weather so the alarmists are right! Or something like that or not. When I was a boy someone older and wiser explained to me that simply because someone predicts it will happen, doesn’t necessarily mean it won’t happen. The predictions are no indicators of real world events, whether you choose to believe them or not. Predictions are random, just like weather. Yup! You want certainty- bet on grant approvals or corrupt politicians. Or sadly nowadays, scientists. Predictions have valuable uses, especially in investing. A broker calls 1000 people. He tells 500 of them that his models show gold is going up in the next year. If you don’t want to invest with him now, mark it on your calendar – he’ll call back and show you he was right. He tells the other 500 that gold is going down in the next year. At the end of the year, gold went up or down. He calls the 250 of the 500 people whom he gave the right answer to, and tells them his models show gold is going up in the next year. invest now – they have proof that he was right. He tells the other 250 people that gold is going down. At the beginning of the third year, he now has 125 people that have seen him correctly call the gold market for two years! Many to most of them will be willing to dump huge money on this broker. He is truly a guru. This is a real scheme – not of my making. It takes some time, but carries huge profits for a broker who uses it. Some scientists at the University of California, Riverside, seem immune to the concept of oscillation. Rainfall is projected to increase by 22% in the global warming theory. This is based on the Clausius Clapeyron relation which says that water vapor and precipitation and evaporation should increase by 7.0% per 1.0C increase in temperatures. 3.0C of warming and all three components of the water cycle go up by 22.0%. All of the climate models build in this projection at essentially these numbers. So far, however, there is only a minimal increase in water vapor which means something else is going on. Something else like maybe it has not really gotten much if any warmer overall? Yes, the weather has actually gotten milder, not more extreme. The CAGW promoters are describing a fantasy world of extreme weather that is nowhere to be found. I wonder why the satellites data charts and maps do not have trends separated out by max and min temps. Giving an average obscures much. If nights are less cool, and winters less cold, but day time and summer stay nearly the same…this shows up as warming, and the headlines blare that we are burning up. excellent observation. A real reporter would ask the same question – except that I doubt they have the mathematical training to understand that. Besides, most of them are too lazy. It is a testament to the power of science that they were able to figure out how to liquefy the permanent and ever deepening drought. Why should model projections be trusted when predicting something good if we don’t trust them when they predict something bad? Bias? Absolutely. A glass of RCP8.5 is a recipe for anything. It isn’t a given that El Ninos will become more frequent if the climate warms due to anthropogenic CO2. Allen et al seem to have the causality reversed. El Nino causes a warmer atmosphere. Where’s the evidence that a warmer atmosphere causes El Nino? As Dr. Spencer points out, we really don’t understand the causes of El Nino and La Nina that well. Dr. Spencer thinks the formation of El Nino and La Nina is related to cloud cover. Some folks think cloud cover is related to cosmic ray bombardment. They also contend that cosmic ray bombardment is related to solar activity … and so on and so forth. They don’t say this is due to El Nino, so they must be saying it is due to atmospheric heating and as Bob says, where’s the evidence for that? I doubt these guys a clue, but even if they don’t they’ve got a fair chance of being right by pure chance. For the sake of the folks living in California, let’s hope they are right. Another study stating what will happen IF the world is warming. And if the world doesn’t warm???? – A lot of people wasting their lives away on pointless “science” papers. It seems very likely we will have decades of cooling at some point this century, perhaps very soon and perhaps beginning now. And when that happens, what next? The insanity will not end. It will be replaced by the next bogeyman. 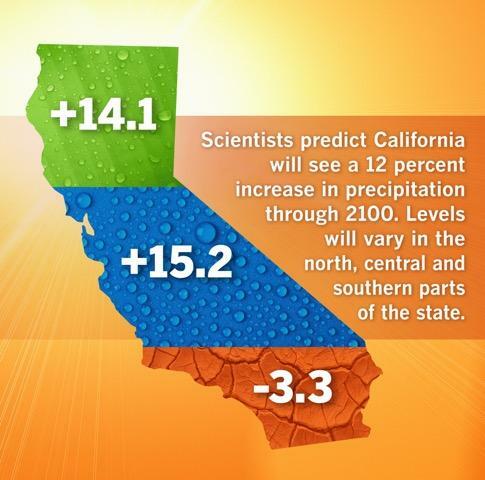 California will be wetter AND it will be drier. The wets and the drys probably make up 97% of scientists, hence it is consensus. I had people tell me, and they were dead serious, that we were in for a permanent drought. Why? Because of all the stupid news articles and people on TV telling them so. There is no end to the convoluted tactics of academia and pundits. “Most previous research emphasized uncertainty with regards to future precipitation levels in California” is not my recollection of events. Drought doom-and-gloom into the distant future, is the way I recall previous predictions of California’s climate by CAGW promoters. They were not uncertain at all. The uncertainty sentence goes at the very bottom of the study, After chapter and verse on the looming disaster. There’s actually a very common plotline. First they make a statement that climate change threatens …..insert big picture apple pie issue here…….Then comes more mights and maybe than you ever saw in one place in your life. After you go take a valium and you’re not really focusing, comes the itty-bitty uncertainty sentence.Telltale signs of propaganda! The study id worthles, they used RCP8.5. It isn’t worth two lines. The Magic 8 Ball: Climate scientists’ most valuable forecasting tool. Our persistent inability to understand the faultless logic of the climatistas is likely due to our fundamental misunderstanding of the concept of flexible timelines. We seem to be stuck on the idea that time only flows in one direction, but in the new climate science it goes forwards, backwards, left, right, upside down and inside out so that research findings are often published prospectively but many years after events they predicted. This can’t be true. After all, the science has already been settled. The science can’t change. Can it? No one can think that we haven’t always been at war with Eastasia. Say no more. I will take the under. No no no. Climate “science” predicts droughtier droughts and floodier floods. Because of man’s evil CO2, all weather, even cold and snow will become more extreme. It’s all basic science, as laid down over a century ago, and as shown by powerful computers using state-of-the-art GCMs. 97% of all scientists agree. What can’t climate models predict? If we look at this as a propaganda war we can view things through a different lens. If so might they not start predicting some of the things we are likely to see in the event of a Maunder Minimum type event although leaving out obvious give-aways like it getting frightfully cold in some regions some of the time? After all looking at the history of the last one there were heatwaves, droughts (like 2 years of drought in India) and of course floods. In other words ‘extreme weather’. If I’m right when it all starts happening they will say ‘I told you so’ now send us even more money! If you don’t you know it will only get worse. I read New Scientist which is a safe space for them. There they are showing no signs of giving up on the idea that it is all down to humans in the ‘west’ using fossil fuels. (Chinese ‘carbon’ is ‘special’ just like the useful idiots that hang on their every word because 99% of ‘scientists’ agree.) I have noticed however that lately they are spending less time on the carbon dioxide part of their meme. Now they appear to just carry on regardless with ‘climate change etc.’ as if they are dealing with something like Newton’s 2nd law, something that everyone takes as a given, leaving their followers to accept whatever they say to explain what people see when they look out of the window. Figure out how to forecast the next month accurately first then work your way out . changes in ocean current patterns maybe we will have a chance to improve the climate change batting average . Till then predictions are virtually meaningless mud thrown at a wall . Thank goodness it’s currently in a long term warming cycle . “Settled science ” complete BS by climate capitalists and political globalists . Mr . Trump was right to drop the Paris charade. When Mr . Trump has America firing on all cylinders other G20 countries are going to be wondering why they peed away billions and wasted their time in a foolish bid to set the worlds thermostat. Mr Trump is the Road Runner and the other clowns are a gang of Yosemite Sam’s . Thanks for that link, Michael. I don’t know about you, but there’s not a dustbowl to be seen anywhere, as far as I can see. Today’s weather is some of the mildest of my lifetime, and I’m not hearing many weather horror stories from other parts of the world. Go back to the 1930’s and check the newspaper headlines and you will find real climate disasters being reported from all over the world during those dustbowl years. Nothing like the mild, benign weather we have today. The promoters of CAGW are living in a false reality of extreme weather where there is no extreme weather to be seen. And they get paid to do this. Unbelievable. The weather is just right where I live. Should I expect it to get just righter? I don’t know if it will get better, but it’s still raining in Oklahoma in July which is slightly unusual (and we love it), and the temperatures are not too hot, either. A real hot summer in the U.S. is fast running out of time to get started. The date when the summer heat usually breaks is in the middle of August, so I would expect we won’t have a serious heatwave this summer, although that doesn’t mean it won’t get hot for a few weeks in different locations, but to build up a big heatwave takes a high pressure system sitting fairly stationary over a spot on Earth, and also depends on the moisture in the ground underneath the high. The moisture prevents the heat from building up too high, although the additional humidity is as hard or harder on humans, than a higher heat at a lower humidity. So a high pressure system will have to set up and start heating us up, and then it will take a few weeks to evaporate the moisture out of the ground, and then the high heat can really start to build up, but in this year’s case, the high heat isn’t going to have much time to build up before the season changes. I have seen years where the high pressure set up early in the year like about March and then hung around clear through the fall, went away for a few months, and then was back in the early spring again the next year, and things really heated up during that next summer. If that is what is projected then that is what will happen. Most of us in Southern California do not need to worry because most of our water comes from Northern California or out of state. Desalination plants is another option. In general we would be safest here in Southern California if we reduced our population.